Now that all is said and done and the water bio-sand filter is filtering away successfully, I thought it would be a good thing to share the things I would do differently next time – a real bonus for any of you starting out, as it means you can get it right first time! So, at a glance you can see that the results came in way within the acceptable levels and the water tastes so much better than from the municipal source with a coal filter. Plus, when we boil the water in the kettle, there is no smell of chlorine. 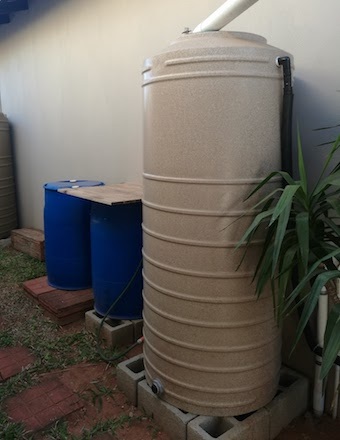 Way too big, just about all the bio-sand water filters I have seen and researched used a much narrower container – best solution being a cement container. The height seems to be fine, but the wide drum makes for too much sand and stone to be prepared. The upside though I would guess is that it does a better job of the filtration. If you have a ball stop valve on the storage drum side, you don’t have to control the water at the tap of the non-filtered JoJo storage side. Water would flow until a certain level in the storage drum is reached, stopping the flow from the Bio-Sand and stopping the inlet from the JoJo. The JoJo to store water from our Zinc-a-lum awning, is too small at 750l, because of the lack of rain of late, this should be around 2500l. Our bio-filter drum and un-filtered storage JoJo are at the same level, which means that once the water drops below the inlet to the bio-filter, the water stops flowing – as it is a gravity feed – no rush of water needed. If the inlet un-filtered storage tank was higher, I would be able to have the water flowing until it reached the bottom of the feed tank, and not stop a meter or so from the bottom. The filtered storage drum should be a higher so that it is easy to reach the tap when decanting into your drinking water containers. A nice enhancement here would be connecting this storage to the household drinking water taps. That is it from this series on the drinking water harvesting, we are extremely happy with our drinking water quality, especially knowing the source of the water and having the water pass all the quality tests with such flying colours.